Yet again I’d prefer to introduce you to an animator through one quick example of his style rather than a barrage. Should you enjoy it there are many examples of his works on Youtube and elsewhere on the web. Švankmajer (born 4 September 1934 in Prague) is a Czech surrealist artist. His work spans several media. He is known for his surreal animations and features, which have greatly influenced other artists such as Tim Burton, Terry Gilliam, The Brothers Quay and many others. Švankmajer has gained a reputation over several decades for his distinctive use of stop-motion technique, and his ability to make surreal, nightmarish and yet somehow funny pictures. He is still making films in Prague at the time of writing. Švankmajer’s trademarks include very exaggerated sounds, often creating a very strange effect in all eating scenes. He often uses very sped-up sequences when people walk and interact. His movies often involve inanimate objects coming alive and being brought to life through stop-motion. Food is a favourite subject and medium. Stop-motion features in most of his work, though his feature films also include live action to varying degrees. A lot of his movies, like the short film Down to the Cellar, are made from a child’s perspective, while at the same time often having a truly disturbing and even aggressive nature. In 1972 the communist authorities banned him from making films, and many of his later films were banned. He was almost unknown in the West until the early 1980s. Short films are an artform in and of themselves. Sadly, there are rarely avenues for these films to be displayed. While the platform I can offer is not a large one I do hope that by featuring short films on the weekend you’ll be encouraged to look for more that you do like or perhaps even work on your own. I will try to get these up on Saturday morning, which may be the ideal time to catch a short film: It’s a relaxed time and you’re in search of some entertainment but your attention span may not be as long as it will be later in the day. 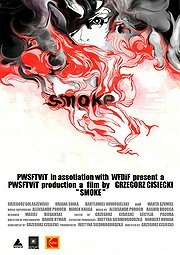 The first film I am deciding to highlight is one called Smoke. It’s a film that was actually brought to my attention via an email from the film’s director. I’m sorry it took me so long to profile it here, however, I am glad he brought it to my attention as it truly is quite special. The film is constructed in a stream-of-consciousness montage that is incited by the turning on of a tape recorder. What words are being spoken on the tape, or to it for that matter (if any), are left for the audience to divine as we don’t hear them. The images are rather surreal and at times completely disconnected and at others only connected by the common motif: smoke, be it in one form or another. While some images are Kubrickesque the film possesses a voice of it’s own that speaks to you in visual fragments seeking your input and associations to determine meaning. I’ve seen the film twice now and had two distinct, but both positive reactions to it. If there is a film that can be said to define the French New Wave it may well be Last Year at Marienbad. A film directed by Alain Resnais (Night and Fog) which deals heavily with memory, or more precisely the accuracy of memory and what is reality. It is a film that moves along dreamlike with many incremental repetitions of phrases, with fractured snatches of conversations creating whole thoughts and at times surrealistically staged scenes. It is a film that engages the viewer that dares him to follow this Byzantine structure and try to get out the other end, and if he does get out the other end will he have his head on straight when he gets there? It is a fact that film is not a disposable medium and many, if not all films, welcome a second viewing. This film insists on several. It is very likely that every time you’ll walk away from the film with a new piece of information you never considered before. This film is a complex abstract masterpiece that makes Inception look like finger-painting by comparison. Which brings to mind another point: The camera pans around this hotel and its surroundings a great deal. Sometimes in conjunction with voice-over sometimes running contrary to the scene. The Baroque architecture of the edifice is quite startling and the hotel becomes a character in the tale in and of itself. As the discussions in which M is trying to convince A they did meet often begin with him stating where in the hotel they were. It is a fascinating and mind-bending film which has no equal or parallel, an infinitely rewarding experience you’ll want to revisit over and over again.